Following my enjoyment of Rain Reign, I sought out an adult-themed novel with a central character on the autism spectrum. Rubbernecker stood out among the lists I found with the promise of a psychological thriller: a genre which rates highly among my preferred themes. What i loved most about Rubbernecker was the layers, so many layers of plot and story, all woven together seamlessly yet the outcomes were elusive until the very end. Patrick, the central character, is a young man with Asperger Syndrome and a fascination with death. Or rather, what happens to the body at the point of death. Having secured himself a place on the anatomy course at Cardiff University, he throws himself into study and meticulously analyses the cause of death for Cadaver 19: the body he and his team are dissecting. Patrick's black and white view of the world places him in precarious situations, including his arrest prompted by the discovery of a human head in the fridge he shares with student housemates. He is determined to bring justice for the unnatural death of Cadaver 19, but finds himself disbelieved and even ridiculed as a result of his neurological disability. 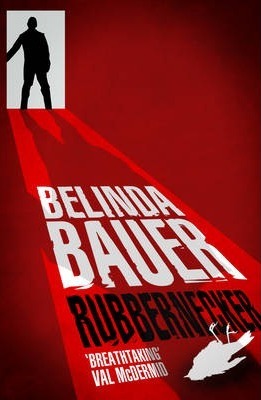 I thoroughly enjoyed Rubbernecker and sincerely hope to discover more psychological thrillers of the same vein.